1 This biographical account is confirmed by the RA Schools register (Wal. Soc., XXXVIII, 1962, no.47); the date of 1770 for the Zoffany painting presumably refers to the time he began to gather individual portraits for the 1772 composition (I am most grateful to Nicholas Savage for his help on this point). 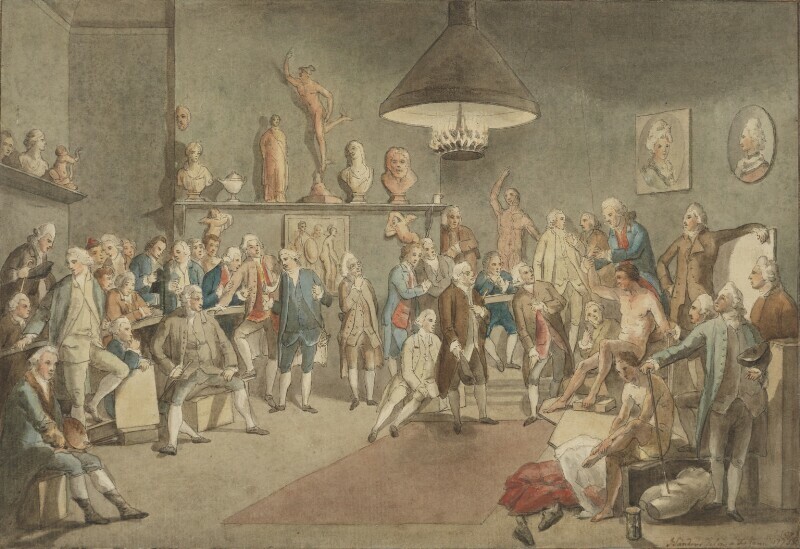 A crude copy of Zoffany’s Academicians of the Royal Academy in the Royal Collection, NPG 1437 is of some interest through the inscription stating that the setting was the RA rooms in Pall Mall. In January 1771 the Academy had moved to Old Somerset House, where it has been assumed Zoffany’s painting was set; but the setting has such little character that it is of no real consequence. As a student at the RA, Sanders would doubtless have been aware of Zoffany painting the individual portraits probably as early as 1770, and he would certainly have seen the finished painting at the RA in 1772; he would subsequently know the mezzotint by Richard Earlom published on 2 August 1773. NPG 1437 shows differences, for example, in the colours worn by Reynolds, Zuccarelli and William Hunter. A pencil tracing (NPG 1437a) has each figure numbered in red ink and a crude, later ink copy (also NPG 1437a) shows the figures alone with a written key. The drawing is too slight for the individual figures to be regarded as portraits, but the sitters (and their RA appointments) are listed below in alphabetical order, followed by their numbers in the key. There were three absentees: Thomas Gainsborough, and Nathaniel and George Dance. Presented by Alfred Jones of Bath 1906. Kauffmann 1968 (415); Artists at Work 1981 - 82 (27a); Hommage an Angelika Kauffmann, Liechtenstein, 1992 (hors catalogue).